Org charts by Ingentis org.manager can be displayed in many ways, adjusting to your target group, the end device, browser and across all version of Microsoft Windows. The desktop version org.manager on-premises is compatible with all versions of Microsoft Windows. It offers a wide range of display options to enable a personalized user experience. For example, the number of levels displayed, zoom factor and arrangement of organizational pieces can be freely edited. The hierarchy tree allows for effortless navigation through the structure of your enterprise. It also facilitates the process of retrieving detailed information about employees, organizational units, positions, and other groupings. The web-based version enables the effortless publication of your company‘s org chart entirely automated and cross-platform via web browser. Therefore, users can access information from any type of device. Thanks to responsive design, each device is recognized automatically by the system, making a smartphone- or tablet-adapted resolution available. Again, the layout can be fully adjusted to your corporate design. Your org chart can be integrated into an existing Intranet or web portal (e.g. Sharepoint) without complication. An additional security module for org.manager on-premises let’s you grant restricted access to specific sections of the org chart or to certain information levels on a user-by-user basis. For example, reports and KPIs can be individually provided to executives and HR managers. 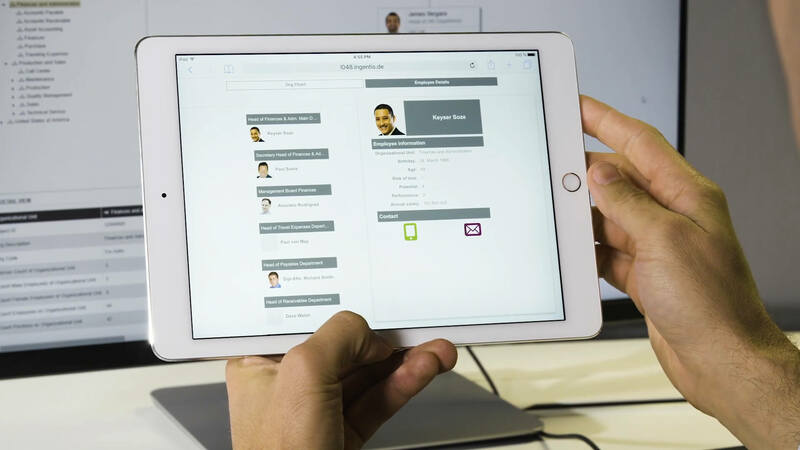 For on-the-go or smaller group meetings Ingentis org.manager [mobile] provides HR personnel and executives with org charts on any mobile device. Suited for daily use, the app gives access to organizational charts as well as deeper level information about departments, employees, and positions.